The boss of Asda has warned that Britain’s struggling supermarkets will face further challenges in 2016 as it fires the first salvo of the year in the industry’s savage price wars. Andy Clarke has said he is pumping a further £500m into slashing prices at the grocer as it faces another brutal year of intense pressure. “There is currently no growth in the food market and the rise of the discounters means that we must take radical action to win back our customers,” said the chief executive. Asda said last year it had reached its “nadir” after posting worst-ever quarterly sales decline in what Mr Clarke called “the worst storm in retail history”. The supermarket is expected to report its sixth quarter of falling revenue next month, although the slump in sales is forecast to have slowed from 4.5pc to around 3.5pc, according to analysts. Mr Clarke’s latest warning comes as the industry reels from the toughest Christmas trading spell since 2008. Next, Marks & Spencer, Waitrose and Sports Direct have all revealed grim sales figures and the City is braced for another flurry of bad news next week. Wm Morrison is forecast to post a 2pc slide, though that would be a slight improvement on the 2.6pc fall in the previous quarter, while Tesco is on course to post a 2.5pc drop in like-for-like sales. 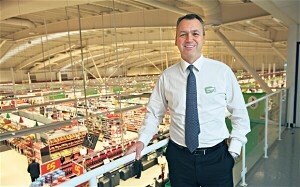 Asda’s latest investment comes on top of the £1bn of price cuts over five years first announced in 2013. Mr Clarke said that £600m had already been spent in rolling back prices, taking the total of reductions to £1.5bn by 2018. “We continue to have the lowest price basket across the big four supermarkets,” said Mr Clarke. The grocery boss said that his objective was to lower the cost of Asda’s baskets to just 5pc more than budget rivals Lidl and Aldi. Last year Asda launched its “Project Renewal” to trim the number of products on its shelves in order to reduce its cost base. It sells up to 30,000 items in its stores, compared to Lidl and Aldi, which have up to 2,500. Mr Clarke revealed that the supermarket had also joined Europe’s largest grocery alliance, which combines £178bn of buying power to lower the cost of goods for private label products. Swiss-based EMD includes 14 European supermarkets such as France’s Groupe Casino and Germany’s Markant Deutschland. During the festive season Asda sold 56m mince pies which, if lined up, would stretch from the UK to Greenland. The second-largest supermarket was also buoyed by the Christmas jumper trend, selling 160pc more novelty knits than the year before. Despite falling revenues, the Wal-Mart owned grocer posted a 2.3pc rise in post-tax profits to £708m last year. “Sales will be under pressure for all retailers this year, the difference is our profitability is robust and that’s not something that others can be confident about,” he added. Mr Clarke said he would “watch with interest” whether rival Sainsbury’s pursues its Home Retail Group takeover attempt and said that it had been “interesting to read the analyst notes so far”. Sainsbury’s is expected to be crowned the winner of the major supermarkets with analysts forecasting a 0.7pc dip in like-for like sales in its festive trading update. Posted on January 11, 2016, in #retail, #uk, Other. Bookmark the permalink. Leave a comment.